"Queen City of the Plains" is what Denver was called when the city first began its growth in 1858. Later, the "Mile High City" came into effect. By the 1960s, much of Denver's character had been crushed to make way for a new skyline. The railroads made a huge difference in Denver's status and thankfully, are still active. I adore this series of Then And Now books from Thunder Bay Press, and even though I live in Colorado (one hour south of the capital), I don't know Denver. I've passed through by rail and air but have yet to "see" the city. Fortunately, many photographs from the early days are still in existence so we can at least see what the city looked like. City Hall (pg 26) was knocked down (such a beautiful building), as was the Tabor Grand Opera House (pg 30). The new version of Curtis Street is positively boring in comparison to how it looked in the "old" days. Thankfully, much of the original Kittridge Building on Sixteenth Street still remains. The Daniels and Fisher Tower looks much the same now as back then. The Denver Urban Renewal Authority was responsible for the change in the Denver skyline, and as a result, sadly, many of the old buildings were razed. The old photographs reflect an era when horse and buggy and trams were the order of the day. Almost "Wild West" on some streets. The superb Denver Gas and Electric Building is a joy - like a Christmas postcard. Many more original buildings still exist - more than I thought - see pages 56/57, 58/59, 60/61, 68/69, and the Denver Mint Building. The State Capitol building is tremendous, as is the exquisite Greek Theater. 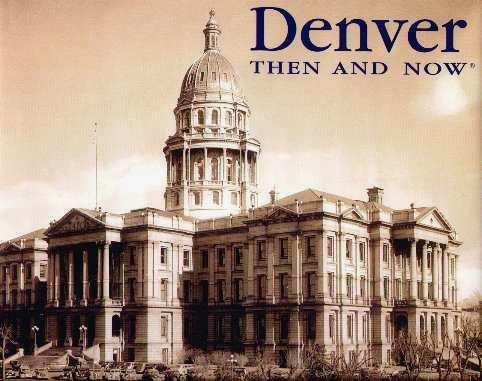 DENVER Then And Now may be purchased and/or ordered through your local bookstore. Conclusion - Very inspirational - gotta see Denver!